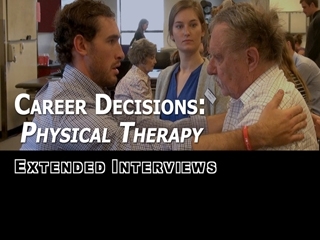 Physical Therapy - Extended Interviews is a 10 part series that thoroughly covers the Physical Therapy career for prospective students. Topics include education requirements and suggestions, the best qualities for a physical therapy student to have, and other advice from experts in the field and current PT students. Dr. Reinking discusses the competitiveness of Physical Therapy school, and what prospective students need to do to prepare. He concludes with a personal success story and how Physical Therapy has changed throughout the years. Dr. Davis begins by explaining how the Physical Therapy profession has evolved in the past twenty years. Next, she talks about what it takes to become a Physical Therapist and what the career entails. She ends with some personal success stories. Dr. Littmann begins by detailing a history of Physical Therapy. He continues by talking about a wide array of applications for Physical Therapy today. He concludes with a personal success story, the responsibility of the Physical Therapist and where the profession is headed in the future. Dr. Smith begins by describing the education required and the many benefits of pursuing Physical Therapy as a profession. He goes on to mention the importance of Physical Therapy in the modern medical world, and concludes with a personal success story. Dr. Nelson-Wong and Dr. Baum begin by talking specifically about their research at Regis. They go on to define evidence-based practice and conclude by explaining how research helps not only students understand Physical Therapy better but in the rehabilitation of patients as well. Dr. Dennis begins by talking about what drew her to Physical Therapy and what it takes to finish a graduate program. She continues by mentioning what is expected of a Physical Therapist and concludes by explaining career advancement in the profession. James begins by explaining how he got interested and ultimately into Physical Therapy School. He goes on to describe his training experience so far, and concludes with a look into the future and his most rewarding experience. Carol starts out by mentioning what drew her to Physical Therapy as a career and what school has been like so far. She concludes with a message to prospective Physical Therapy students. Geovanni begins by explaining why he got interested in Physical Therapy as a career and how school has been going thus far. He concludes with a look into the future and what his parents think about his career choice. Lexie starts out by describing how her Physical Therapy school experience has been so far. She continues by talking about what areas interest her the most, and concludes with a message to prospective students. Copyright ©2017 Ambrose Video Publishing Inc.